Happy to report as suitable offerings catch my eye,although the field is rather a moving target! Many of these Chinese modules seem badge engineered, & config. utilities may work on different makers offerings. Hence this WT-800 (which sports well produced data sheets) may be akin to Dorji's. EXTRA: Microchips RN2483 LoRa&#8482; module may well be the best approach however, especially in EU/UK/USA markets. It's at the heart of this new French HidnSeek . So if you had some Dorji LoRa UART modules, and its just not convienient to remove them from your application and use the PC application to set them up, what are the PICAXE commands to setup the device for say 434.400Mhz, Bandwidth 62.5khz and Spreading factor 8 ? I did look in the data sheet but it was not obvious. And they both label the bandwith (hertz) as bps. Microchips RN2483 LoRa&#8482; module may well be the best approach however, especially in EU/UK/USA markets. Seems to be one of the very few to take ease of use (of a UART style module) seriously, the interface commands are relativly understandable. Whilst providing a PC application to configure a UART device is often promoted as a good thing, both with LoRa and other UART modems, it does suggest that the base module is difficult to program. If your front ending a RF device with another Microcontroller, why not program it so that the commands to drive it are easy to understand ? srnet: I certainly concur that config. can be cussedly cryptic! It's somewhat akin to Wordstar (the popular WYSIWYG but pre GUI early-mid 1980s CP/M & DOS word processing program),which used the likes of ^B to start (& end) bold or ^Y for italics. Argh! Best grit your teeth & check Andrew's embedded PICAXE Dorji DRF1278DM config. code approach below. FWIW: This advert states such recent LoRa&#8482; modules as the WT-800 are pleasingly AT friendly. However inspection of the WT-800 data sheets ( P.11) implies "AT" is used loosely & that config. is still Dorji style. Thanks Stan, my teeth are well and cruelly gritted. Thankfully Robert Rozee has shown there are more convenient ways to set up an RF transceivers module and, as Stuart states, why not make it possible to to this from the host microcontroller (as an alternative to the PC). No problem in providing such libraries for LoRa, just needs someone much smarter than me. Yes- code refining certainly possible! The tedious approach above was intended more as a expansion of Dorji's data sheets. Typo on that "power level 17" - did you mean just 07 ? I personally also prefer Microchip's well priced (~US$15) RN2483 & consider it presently perhaps THE LoRa™ module for the masses. Check the "hats off" pix below & note (thanks to an Arduino offering) that only a few connections are needed for simple serial work. Stan. Typo on that "power level 17" - did you mean just 07 ? The SX1278, the heart of most LoRa modules can be set (on most modules) from 2dBm to 17dBm, so on all the software I have written the power level can be set directly in dBm, the obvious way to do it really. Which is a perverse way to do it IMHO. Aha - dBm it is! To add to the confusion we've NZ Radio Regs. that insist on using dBW for TX power levels. Hence the Aus/NZ legal power limit on 433 MHz is -16 dBW = 25 mW = 13.97 dBm (= Dorji's "5"). But enough of this banter. Here's news, presently woefully short on technical details, of a prize winning Mexican poverty combating LoRa&#8482; based "Nodi" project. That's a nice project... and hopefully eventually we'll have something from RevEd... i didn't know you southerners used dbW... that's quite an opportunity to misread specs! We normally don't (aside from NZ radio reg. cussedness), as mW & dBm far better suit in most applications. Ah - I assume you realise that NZ means South Pacific New Zealand rather than AZ (Arizona !) ? Details on the Mexican "Nodi" LoRa&#8482; project elusive. AFAIK the Spanish for "node" is "nodo", but even Googling that variation didn't help. As their 1 million Mexican peso prize translates to ~US$50,000, one would expect a decently concrete account rather than hype. Anyone in that region have technical insights ? Stan. Stan, don't you know that the level of hype is directly proportional to the amount of funding? The 1-million-peso first prize, which went to a team from Guanajuato called Brainiacs. The winning proposal was called Nodi, a free, text-based communications service intended to overcome connectivity shortcomings in remote communities. &#8220;We had been raising funds for a year but [money] was running out. It was then that we decided to risk it all at the Campus Party,&#8221; explained team leader Javier Dávila. It looks like they are taking a cell-phone approach which will be using a free band for the cell network. Although maybe using a "free" cell band (800-900 MHz ?) their project of course was hailed as LoRa&#8482; based. Aside from larger antenna issues (& if local TX power etc regs. had allowed),they'd probably have got better rural terrain penetration at lower (VHF ?) freqs. FWIW: The superior propagation punch of lower freqs. is being recognised by UK's OFCOM,and - along with other spectrum usage factors - they're soon to open IoT bands between 50 & 80 MHz. These days such frequencies are almost DC ! Taiwanese firm Acsip have just released "the world's smallest" (13mm x 11mm x 1.1mm) LoRa&#8482; modules. That tiny footprint is akin to a finger nail sized 8 contact microSD card -it's hard to credit that the crystals are also within that 1.1mm ! There's both a 433-470 MHz S78S and a 800-900 MHz S76S. They feature inbuilt SX1278/6 LoRa&#8482; + STM32L073x MCU. Prices apparently US$18-20 (a pair ?). Although only a limited number of connections need be made, the 16 x 20 (72 point) LGA (Land Grid Array) profile has daunting sub mm spacings that'll prevent easy soldering... Fewer point LGA adapters are available, but they're apparently not yet LGA-72. Any thoughts ? 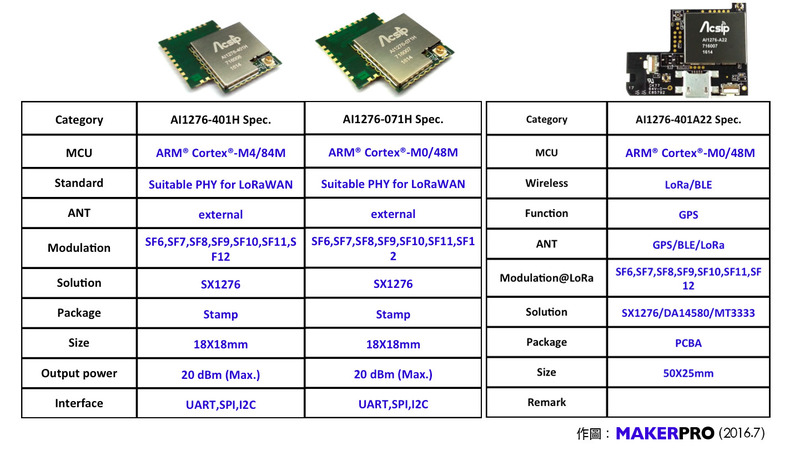 Acsip also offer larger LoRaWAN modules =>http://makerpro.cc/wp-content/uploads/2016/07/Acsip-Lora-modules.jpg. Three new devices,SX1262 (+22dBm),SX1261(+15dBm)& SX1268 (+22dBm), China frequency bands) are currently sampling to lead customers and partners and will be available in full production in late Q1 2018. Development kits for various regions and associated software will also be available at that time. For more information, visit => www.semtech.com/iot. These look worth waiting for if you intend a LoRa project ! Stan. LoRa aloft - and about time! High altitude balloon trials run some years ago by SRNET showed ranges of many 100s of km using just 10mW 433 MHz LoRa transmitters. Similar open ocean satellite based monitoring- known as S-AIS - is already available for the marine VHF collision avoidance Automatic Identification System. Marine Traffic has probably the best known live global AIS tracker.They may charge $ for access, but there're numerous free sites suiting shore side vessel monitoring. Note: Even coastal AIS uses far more powerful vessel transmitters than IoT's flea power. Heads up for UART, breadboard & -especially- AT command friendly REYAX (Taiwanese) RYLR8xx/40x LoRa modules. Cost ~US $15 each from the usual online outlets. I've yet to come to grips with them, but good reports have emerged - Google & Youtube. Stan.